I came across another fabulous Rast hack that I had to share. 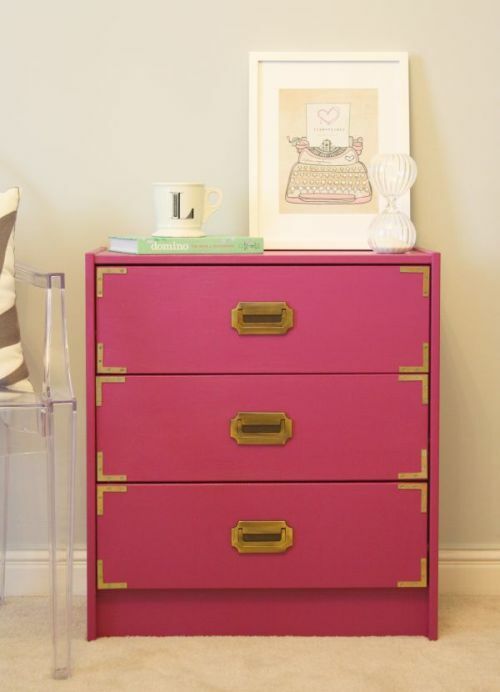 This one comes from For Chic Sake, a gorgeous fuschia painted campaign chest ! I think I might need to buy another Rast dresser and try another hack! Don't forget to enter my Beautiful Words art poster giveaway! This is really one of the best ones I've ever seen! I'd never think of some of these hacks, and then when I see them I wonder why not! This is gorgeous!!! I am loving the hot pink. Super fun. I adore this hack. The colour is so perfect and so me. It's so great with the pink and gold! My new favourite hack! Oh my. I haven't seen this done in pink like this and it's GORGEOUS. Yup, I think you should go for it!!!! Love everything about it. I think also that you should take on these projects and open up a store called RAST HACK. I'll work part time for you. Oooh I love it! Those gold handles are gorgeous with the pink colour!